Overseer Network Monitor uses the standard Windows ODBC database layer or MSSQL native connectivity, allowing you to monitor the results of any SQL Query. This can be used to check on the count of records in a table that match some criteria, server variables, and execution speed of key queries. Database connectivity and functionality is implicitly tested by testing any of these things. Overseer Network Monitoring Software is capable of monitoring any database with an ODBC driver, or MSSQL natively. This includes Microsoft SQL(MSSQL), Oracle, MySQL, PostgreSQL, SQLite, Visual Foxpro, DBase, text files, and many more. This allows you to monitor all your critical databases from a single monitoring workstation. Email Alerts or send SMS/text messages can be sent when a query doesn't execute quickly enough, returns data that you've defined to be wrong, etc. Overseer monitors database connectivity implicitly whenever a database query resource is tested. This is very useful for general database monitoring. Simply use a 'SELECT 0' query if you don't have anything more useful to test with. Overseer can monitor any ODBC data source. This includes almost every database out there, including the big ones such as Oracle, MySQL, etc.. It also has the benefit of monitoring text files and other file-based databases such as Visual Foxpro, Excel, Access, etc. Overseer can monitor MSSQL databases natively. This is useful, because you don't have to setup an ODBC DSN for every MSSQL database you monitor. It also enables you to use integrated security to login to MSSQL, which is required for some installations. Overseer lets you execute any SQL query. This can be as simple as 'SELECT 0', or a very complex query with joins, etc. 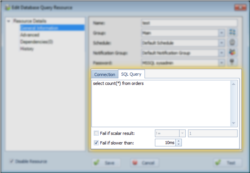 The data returned from this query can be even more useful than the inherent database connectivity monitoring provided by the resource. For MSSQL, this can be used to extract MSSQL system variables, which can provide critical information for MSSQL database monitoring. Overseer lets you evaluate the database query's return value, to make sure it evaluates how you'd like it to. If you're checking an orders table, you may fail if the value is below a specified threshold. If you're checking an error table, you may fail if the count is greater than 0. If you're testing a system variable, such as the size of a MSSQL database, you may fail if it's approaching the database limits(such as it might MSSQL Express installations). Overseer also lets you test the time required to execute the SQL query. Sometimes a database server simply slows down, and testing the execution time for a specific query, such as a common query used in the database's application, can provide you notification that something is wrong.